Welcome to day 3 of the 10/10/10 Project; "10 Women, 10 Businesses, 10 Questions" (Actually, in this case it is the 8/8/8/ Project, a couple of people had schedule conflicts). Each day, for the next 8 or so days, I will be featuring an amazing artist, and creative spirit who has started and built their business from the bottom up. Each artist will answer the question . . .
Valerie Weller considers herself an art creator, a lover of color, and a seeker…. She has spent most of her life as a graphic designer with a fine art background, yet in the past few years, has been transitioning into developing & creating her own body of work. Her dream is to create, paint, and share her process full time. Passionate about color, Valerie works in watercolor, acrylic, oil and mixed media. She holds a BA degree in art with a minor in education. After a solid thirty years of running a successful freelance graphic design business, she is now transitioning to create "part two" of her artistic life, in the world of painting. 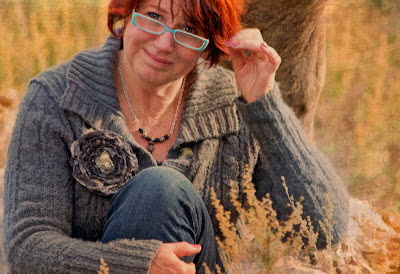 Currently she is developing various works of art in the mixed media category. From small to large paintings in an organic, intuitive style, to art journaling in watercolor, & mixed media, her work continues to express her passion for color and expressive, organic forms. Valerie shows her work at boutiques, art shows as well as online through her etsy shop, website, and blog. She is working on an e-course/video series in watercolor, based on the wonderful response to her art journaling pages. Valerie loves to connect with people and works to inspire other's to believe in their own gifts. Her hope is to connect through her art, to cultivate and nurture the development of each person's individual "art spirit". 6-What part of your business have you delegated or put on hold in order to focus your energy more efficiently? As of now, I am wearing all hats, since I am in the development stages of building my "art business". I suppose after the business grows more, the time will come to streamline the process, wherein I will need to delegate to an assistant. Confession: of all the daily business tasks necessary, shipping is the one I would love to hand off first. Packing, shipping, labeling and post office are not my cup of tea. I tend to spend more time packing with love and making things look good, that I end up losing time in the day, unnecessarily. I know that once I can afford to delegate business chores,(not limited to just shipping) there would be a lot more painting and development happening.